Last Friday we started our look into the history of computer messaging and which applications and services we have used to communicate over computer networks through the decades. So far we have covered the time period from 1960 to 1990, i.e. the era before the birth of the World Wide Web that we live in today. 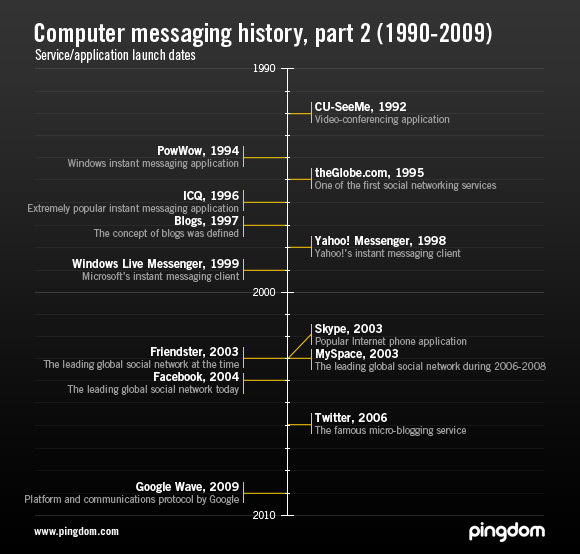 Now it’s time to continue our journey through the history of computer messaging, from 1990 until today. Since we have already covered some of the technologies that are in use even today, such as email and IRC, we didn’t include them here. For the curious, go have a look at part one of this two-part series. So here they are, some of the most popular computer messaging applications and services during 1990-2009, including some less known ones that helped drive innovation and development forward. We chose to include some social networks here as well since they are widely used for messaging between friends. And here follows a more in-depth look at the apps and services mentioned in the timeline. CU-SeeMe is a video-conferencing application that was first released for the Mac in 1992 and for Windows in 1994. The software made it possible to make video calls over the Internet. The earliest versions of the application only supported video. Audio support was added later on. CU-SeeMe is recognized as a pioneer of video chat software and is was one of the first platforms that proved the viability of IP networks (i.e. in this case the Internet) to be used for real-time communication. PowWow was launched in 1994 by a company owned by John McAfee, best known as the founder of the anti-virus and security company McAfee. It was one of the first instant messaging and chat applications available for Windows. PowWow introduced several innovations such as allowing users to talk to each other (voice chat), shared whiteboards and sending messages to offline users. The social networking service theGlobe.com was founded by two college students late in 1994 and went live in 1995. They managed to raise $15,000 to found their software company and buy the Apple Internet Server that they used to launch the service. The company later went public in 1998 but was hit badly by the dot com bust in 2001. The website is considered as one of the first social networks. ICQ is an instant messaging application which was developed by the Israeli company Mirabilis in 1996. ICQ was a huge success and AOL acquired the company in 1998. ICQ was extremely popular during the end of the ‘90s and is still used by many today. Blogs, such as the one you are reading now, was coined in 1997 by Jorn Barger, as “weblogs”. Later on it was shortened to just “blog”. In the beginning there wasn’t any dedicated software available such as WordPress so most blogs used custom solutions or were updated manually. We included blogs here because although in one sense they’re one-way communication, the comments and interactivity of most blogs have played an important role as a communication method. Yahoo! Messenger is a well known instant messaging application which was launched in 1998 using the name Yahoo! Pager. Windows Live Messenger is Microsofts instant messaging application launched in 1999. It was known as MSN Messenger before recently changing its name. Skype was launched in 2003 with lots of buzz surrounding it. It quickly became one of the most popular applications to make voice calls over Internet. The software also has connections to landlines and mobile phones. Skype is also well known because eBay acquired it in 2005 for a record $2.6 billion (and this year eBay is selling it). Founded in 2002 and launched early in 2003, Friendster quickly became the leading global social networking service before it was ultimately supplanted by MySpace in 2006. The service pioneered several features that are common in social networks today. MySpace is a social networking site that launched in 2003 and is currently owned by Fox Interactive Media. The site was for a period during 2006-2008 the largest social network in the US and much of the world. Facebook is a social networking site started in 2004 originally to help students communicate with each other. The site has grown to become the largest social network in the world. One of the main things that Facebook has introduced is that you use your real name online instead of the usual nicknames. Twitter is a micro-blogging service used to send short messages (tweets) or status updates. The service is limited to only allowing 140 characters in a message. From its start in 2006 the service has had a strong growth and is now a popular way for many Internet users to communicate their thoughts. Google Wave is a platform and communications protocol announced by Google in 2009. It’s still in its infancy so only the future can tell if it will be a success. It is designed to merge the functionality of email, instant messaging, wiki and social networking. Being from Google has helped give it a lot of buzz even at this early stage. Now that we’ve caught up with “today” in terms of the ways we use computers to communicate with each other, what does the future look like? We don’t know (who does? ), but it will be interesting to see how initiatives like Google Wave will evolve. The importance of mobile devices and their geo-location capabilities will most likely keep growing and be tightly integrated with the way we communicate. There are so many interesting opportunities for innovation in that field with today’s smartphones (essentially pocket computers). For example, imagine being able to send a message to those of your friends who are currently within a one-mile radius from where you are. As for the applications and services we listed so far . . . Did we miss anything? Let us know in the comments! I worked for a large credit union in California in 1972 when our accounting went “online” with a computerized system. My job was to make all corrections to erroneous transactions within the online (computerized) accounting system. I’ve been working with computers, in one way or another, ever since.